Precision downhole pumps are an industry standard. No matter how much fluid you need to pump out of the hole, Precision pumps couple to and pump system. Precision manufacturing makes positive displacement pumps for oil wells and replacement parts; for 1.9″ to 3.5″ tubing sizes and 1.25″ to 2.75″ pump bores. carbon steel material for most cages and connecting parts. Recommended for mild to average pumping conditions where abrasion and corrosion are not a problem. admiralty brass recommended for mild abrasion and average to severe corrosion. special high strength alloy steel parts made upon request for special applications. for increased cage life, cages are available with a #6 genuine stellite lining on ball guides. Available in steel, stainless, and monel. in spray metal surface, chromed, 316 SS and grooved body. 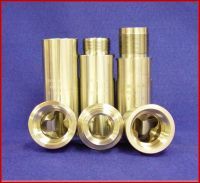 Plungers for both insert and tubing pumps. Precision ground on the OD, our plungers meet all API specifications. Available in pin-end and box-end. Pins are available in monel, stainless steel, alloy, and other materials as requested. Spray metal plungers are recommended for severe corrosion and abrasive conditions. Our precision tubes are ground on the OD and flame sprayed with a nickel base alloy powder containing chromium, boron and silicon to create a hard coating (Rc 58/62). Available with different pins and also box end plungers for tubing pumps. Chrome plungers have a hard chrome plate (Rc 70) that are resistant to abrasion where corrosion is not a factor. Available in all sizes with box end plungers for tubing pumps. Available in both spray metal and chrome plated. STAINLESS STEEL– ball and seat are made from a series 400C stainless steel and are oil quenched and tempered to develop good abrasion and moderate corrosion resistant properties. TITANIUM CARBIDE-a powdered metal material, not a cast material as found in alloy, this ball is homogeneous throughout, the outside skin is the same as its core, one of the reasons it earns a Rockwell hardness rating of 90. Titanium has more abrasion resistance, will not deform, and has better pitting resistance than alloy. TUNGSTEN CARBIDE-excellent abrasion and corrosion resistant properties, carbide balls and seats are recommended for the most abrasive fluids. ZIRCONIA-made from partially stabilized Zirconia, valued for its unique properties of inertness, high temperature stability, strength and toughness. Corrosion and impact resistant. SILICON NITRIDE (DURABALL)-Si3N4 is light, hard and has low thermal expansion coefficient. It has high mechanical strength, fracture toughness, and it is resistant to deformation. Particularly resistant to corrosion and abrasion. NICKEL CARBIDE-nickel binder material is advantageous when both corrosion and wear resistance are required. This material suited for more impact when compared to other Nickel grades.